It can be hard sometimes to feel good about paying insurance premiums. After all, it can feel like you’re throwing money away, especially if you don’t make any claims. The reality, though, is that insurance is about risk management. While you might not like making the premium payments, the truth is that you might be in worse shape if you have to come up with all the money you need at once. Insurance is designed to help you protect your assets. You can probably afford $75 per month for auto insurance, but could you afford to spend $15,000 on a car if yours is totaled? What if you cause an accident and you are responsible for $50,000 in someone else’s medical bills? From your home to your health, there are a number situations in which insurance can help reduce the chances that you will be completely destroyed financially by setbacks. You can get some help by self-insuring for some items, but for the really big things, insurance is usually a good idea. Plus, in some cases, it might be required by law. Except in very specific circumstances, the requirement to get health insurance is the law of the land. Chances are that you need to sign up because you’ll be fined if you don’t. However, that’s not the only reason to make sure that you have health insurance. Health care costs continue to rise. Even though they are rising at a slower pace since the enactment of the law, the fact of the matter is that in a for-profit health care system, there will always be increasing costs. Additionally, as baby boomers age, there will be more strain on the system and that will lead to higher costs as well, no matter how much the pace of increases has slowed. While you might be able to handle the cost of an occasional doctor visit or pay for your prescriptions if they aren’t too expensive and you can find generic versions, very few of us can handle a trip to the hospital in the case of a true emergency. A trip to the hospital can cost upwards of $25,000 easily, and even more, depending on the severity of your condition and the time you spend. Purchasing health insurance is one way you can reduce the chances that you will wind up financially devastated by your health care needs. If you are younger, you can get a catastrophic plan that is cheaper and will cover you in the event of a major accident or illness. Combine a plan with a Health Savings Account (if you qualify), and you can reduce some of your costs and get a tax advantage to boot. Your health is your biggest asset. If you aren’t able to protect it as needed, it could cause problems down the road. Make sure you get the right health insurance coverage for your situation to avoid bigger financial issues later. Like health insurance, auto insurance is required by law. All 50 states in the U.S. require you to get auto coverage if you have a car. It’s important to have auto insurance coverage because you can be penalized on a legal basis, and fined, but also because it can be expensive to deal with the aftermath of car accidents without the help of insurance. Auto insurance comes with a liability component designed to protect you if you make a mistake and cause an accident. You are covered in the event you damage someone else’s property (including their car), or if you injure someone and they have to go to the hospital. The cost of paying those bills on your own would be prohibitive. Not only do you have to worry about your liability, but you should also pay attention to your own car. If you are in an accident and need to replace your car, it can be expensive if you don’t have insurance to cover the cost. Insurance can pay for repairs, as well as help you recover the cost if your car is stolen. Check with your state to find out what the minimum coverage requirements are, and then consider your individual needs to determine what the right amount of auto insurance coverage is. While your health is your best asset in general, your biggest financial asset is likely to be your home. This is why homeowners insurance is so important. If you have a mortgage, your lender might require you to carry homeowners insurance. Chances are that you can’t replace your home if something happens to it. If a natural disaster damages or destroys your home, do you have hundreds of thousands of dollars available to rebuild? Probably not. Your homeowners insurance can also help you recover the value of stolen items, in the event there is a break-in and valuables are stolen. It’s important to carefully review your homeowners policy, though. Not everything is included in your coverage. You might not be covered for some disasters, like flooding, tornadoes, or earthquakes. Double-check to see if you need to buy extra insurance, depending on where you live. If you live in an area with a high water table, or near a river, flood insurance might be necessary. Your homeowners policy might cover damage from a burst pipe or backed up sewer, but it probably won’t cover it in the event of an overflowing river or rising groundwater. Check into the local conditions, and get extra coverage as needed. Even if you don’t own the home you live in, you might still need insurance. Renters insurance is designed to protect the contents of your home in the event of natural disaster, fire, or theft. Many landlords require you to purchase a renters insurance policy if you move in. While the landlord has their own insurance to cover the structure itself, your landlord’s insurance won’t cover your belongings. Think about the things that you have: computers, TVs, furniture, and other items might be more valuable than you think. The contents of my own rental home would probably cost about $15,000 to replace. I don’t want to come up with that money on my own, so the renters insurance is worth having — even if it weren’t required by my landlord. This is one of those things that you get for others. Life insurance isn’t necessarily for you. In fact, it’s more about taking care of your family if you pass unexpectedly. Life insurance provides a payout for your family if you die, allowing them the financial resources to move forward and be successful with their lives. This can be an important thing for them, especially if you are a breadwinner. Figure out how much your family would need to survive if you passed on, leaving them without a source of income. How would they manage in the long run? The right amount of life insurance coverage could help them pay off debt (including mortgage debt), cover living expenses, and even pay for college. Think about how much your family would need to grow up living the same lifestyle if you were gone tomorrow. Get the right insurance coverage to reflect your financial contribution to the family — and to make up for it if you end up passing on. Don’t forget that stay at home partners also need life insurance coverage. Even if your partner isn’t making money outside the home, s/he is probably contributing to the family in ways that are hard to quantify. Stop and think about it. What services would you need to hire out for if your stay at home partner passed on? It’s hard to adequately quantify the contributions a stay at home partner makes. If you lost your partner, you would have to make up for some of these jobs. You would either have to find time to do them, or you would have to hire someone to help out. Getting a life insurance policy for your stay at home partner makes a great deal of sense when you look at this way. The payout from the policy could help you defray some of the costs. Think about your situation, and then decide what level of coverage makes sense for you and your partner. While many of us think about life insurance at some point, we often don’t think of disability insurance. However, the need for disability insurance is probably greater than you think. Check with your employer to see if disability insurance is one of your benefits. Then determine whether or not it’s adequate for your needs. Remember that disability insurance covers time you can’t work if due to illness or injury. In some cases, it’s possible to self-insure for short-term disability if you have a big enough emergency fund. However, long-term disability might be a different problem. You might not have what you need to cover some of your lost income due to long-term disability. In these cases, it’s important to make sure you are covered, especially if your family relies heavily on your income. In most cases, you’re more likely to be disabled than to die, so making sure that your family has necessary financial resources is important. In case you are a single person, it’s important to evaluate whether or not you need to have a life insurance policy in place. Not everyone needs travel insurance, but it can still be a big help if you go abroad. Before you leave the country, check with your health care provider. You might not be covered for medical problems outside the U.S. Additionally, if something happens and you need an emergency medical evacuation, it might be very costly. Consider what it might cost if you were removed from a country via airplane or helicopter. If your insurance doesn’t cover that cost, you could end up financially devastated. There are also policies, like trip insurance, that can help you avoid losing your money if something goes wrong and you have to cancel. You might pay for a cruise, and then run into a problem that forces you to miss it. Without travel or trip insurance, you might find yourself on the hook for all that money — even though you didn’t get to enjoy the cruise. You might have some limited travel insurance through your auto policy, credit cards, or other sources, so check into your coverage before you buy a separate travel policy. Also, make sure you understand what’s needed for the area you’re visiting. In some cases, you might reach a point where it makes sense to get extra liability coverage. This is known as umbrella insurance. Most people don’t actually need this insurance, but it can help if you have a high net worth, or if you have special circumstances that might require insurance coverage that goes beyond the scope of your other “regular” policies. High net worth individuals are more likely to be sued in various instances, whether it’s for a car accident, some sort of professional problem, or something else. Having umbrella insurance can help you further protect your assets in the event of a lawsuit. If you have certain possessions, such as ATVs, that might result in more dangerous situations, you might need additional coverage. In some cases, it can make sense to get extra coverage if you have a dangerous pet that could increase your liability situation if it becomes a nuisance or injures someone else. Consider your situation to determine whether or not it warrants umbrella coverage. If you own a business, or if you are a professional, you might need extra business insurance. You will need separate business policies for liability and structure protection if you own a brick and mortar building. Professionals often need errors and omissions insurance to protect them if someone sues them over the advice they provide. Doctors and other health care professionals might need to carry malpractice insurance to protect them against lawsuits. Think about the types of insurance you might need for your business activities. If you work from home, this might mean extra riders for liability and property loss or damage, since your homeowners or renters policy might be inadequate to cover your business activities. If you drive your car for business, different insurance might be necessary to cover your business activities. Make sure that you are covered so that if something happens to your business, you are able to absorb the cost better, without it devastating your business or spilling over into your personal finances. You should be careful about a long-term care policy. In some cases these can be great ideas. My great-aunt was covered by a long-term care policy, and it was a great comfort as her condition became such that she needed assisted living because others couldn’t care for her. Long-term care insurance took care of the cost. You can save up for these costs, or look for other options. However, it’s important that you don’t rely overmuch on Medicare, since most assisted living facilities aren’t covered by Medicare. Pay attention to the policy you choose, though, and make sure you understand all the terms and what’s covered. 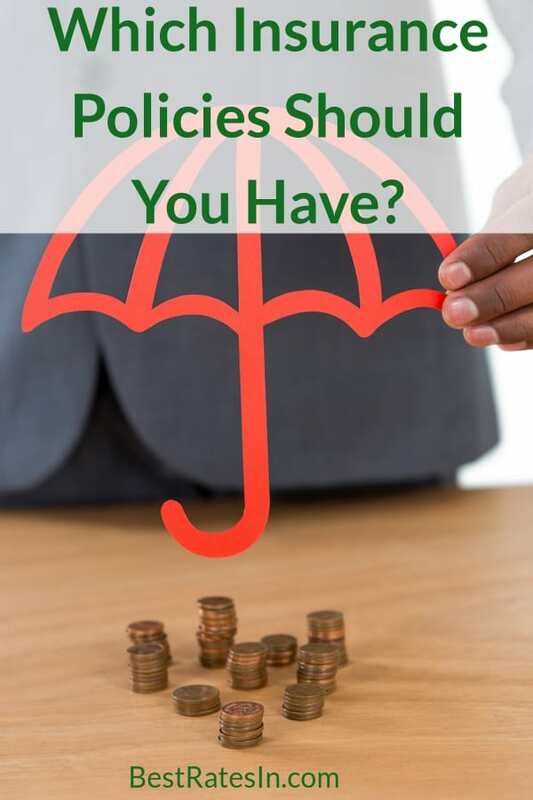 While there are insurance policies that you do need, or that can help you better protect yourself depending on the situation, there are some policies that are almost never needed. The purchase of flight insurance, rental car insurance, child life insurance, or credit card insurance is almost never necessary. There are some cases where it could make sense, but most of the time, these policies are a waste of money. Additionally, it’s a good idea to think twice before purchasing vision and dental insurance policies. If you can get a good deal through your employer, these policies can make sense. However, if you are self-employed like I am, these policies can be more expensive than they are worth. It can be more cost-efficient to save up money for these costs, or to use a Health Savings Account. Some consumers like the idea of funeral insurance to take care of the cost of passing, and this can be a good deal for some people. However, if you are careful about how you plan your life insurance, funeral insurance is probably unnecessary because the life insurance payout will help take care of the cost. Everyone’s situation is different, and not everyone needs all the insurance policies available to them. However, chances are that some policies will be good for your situation and allow you to better protect your assets, your long-term finances, and your family’s future. At the very least, the right insurance coverage can provide you with peace of mind.